Information for this section is reserved for past reunions. If you have any reunion-related photographs, memorabilia, or evidentiary material please send it to the site administrator along with any supporting captions/comments. 1. Reunion attendees received a welcome letter from Menomonee Falls Village Board president, Randall Newman. Click here to view. 2. 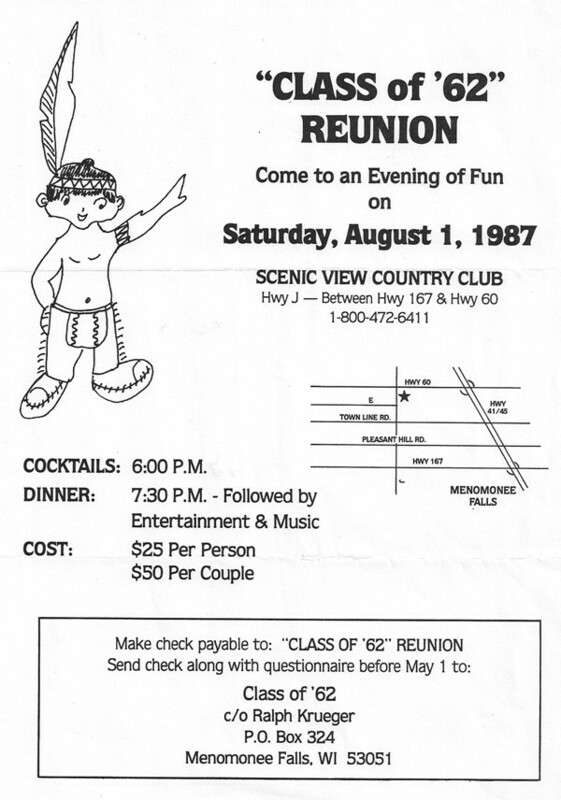 To view a copy of the Reunion evening program held on Saturday, 7/28/12, click here. 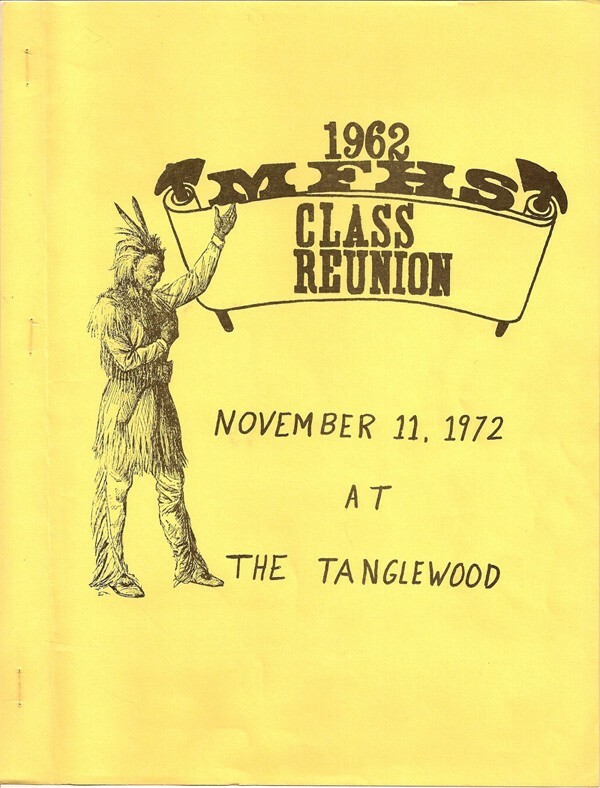 Besides a list of classmate and guest attendees, it contains information on how to participate in future reunions. 3. To see one of the reunion music videos, click the title/links below. In Memory was shown before dinner. Military Tribute and Reflections were presented after dinner in that order. Celebration is a compilation of photos taken during the reunion weekend and made available on DVD about 8 weeks later. c. REFLECTIONS: Uploaded final version in 3 parts to stay within YouTube size limitations. For optimum effect, suggest viewing in order). d. CELEBRATION: Uploaded final version in 4 parts to stay within YouTube size limitations. For optimum effect, suggest viewing in order. 4. To see a copy of our commemorative 50-Year Reunion Cookbook click here. 5. To view a sample of some photos taken, click on Looking Back>Photo Gallery in the left hand navigation bar and then click on "50-Year Reunion Sampler" and "Spouses and Guests of Classmates." (Additions/corrections to the captions are welcome). Row 1 (left to right): Barbara Jean (Loether) Bock, June (Lang) Buchmeier, Fran (Kaiser) Becker, Janet Grube, Judy (Casper) Burden, Randy Kons, Russell Gerds, Dan Pagel, John Miller. Row 2: Grant Casper, Dave VanAlstyne, Gerry Walther, Kathleen (Gross) Pape, Joe Niebler, Cookie Bellmann, Ken Storck, Jim Beringer, Bob Viola. Row 3: Ralph Krueger, Mike Lehmkuhl, Judy (Lex) Kautza, Kathy Leisner, Eileen (Burkwald) Strauss, Mary (Janzer) Engan, Bonnie (Herb) Ullsperger, Nikki (Parker) Fogel, Bonnie (Kuhl) Woehlkel, Cheryl (Opsahl) Maas. Row 4: Bob Walther, Van Uttech, Ray Behl, Bob Umhoefer, Connie Campbell, Ray Umhoefer, Louise (Landry) Urmanski, Janice (Weber) Perri, Ralph Fogel, Ed Adams, and Ken Stanke. Click here to view booklet highlights.